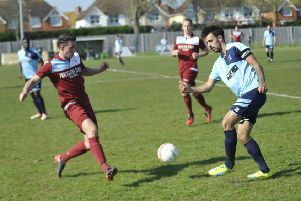 Bexhill United Football Club could have three new signings in its squad to face high-flying opposition tomorrow (Saturday). Liam Foster, Zack McEniry and Jack McLean may all feature in the Macron Store Southern Combination Football League Division One fixture at home to second-placed Wick. McLean, a talented wide player, was a regular in the Hastings United side until suffering a serious knee injury on the final day of the 2015/16 season which has kept him out ever since. “We think it’s a really big signing for the club,” said Light, who was a coach at Hastings when McLean played there. “He was a Ryman League player and absolutely shone at Hastings. Foster, a diminutive young attacking midfielder, had a brief taste of first team football at Hastings before joining Bexhill’s crosstown rivals Little Common, for whom he performed well in the early part of last season. Light expects to get the transfer of McEniry from Little Common completed by the end of the week. The central defender had been more out than in Common’s side so far this term and was the subject of a seven-day approach from Bexhill in the second half of last week. Common lead the table on goal difference from Wick and will therefore be hoping Bexhill can do them a favour at The Polegrove tomorrow. Bexhill will certainly go into the game on a high having scored 11 goals and kept back-to-back clean sheets in emphatically winning their last two matches. The 8-0 thrashing of Midhurst & Easebourne a fortnight ago and 3-0 win away to Storrington last weekend have lifted Bexhill into the top six with 21 points from 13 games. “We seem to have got our act together a little bit,” added Light. “Wick are a good side and it will be a good opportunity to test ourselves against one of the standard bearers of the league. Little Common and Wick seem to be showing that consistency to get out in front. Bexhill are expected to make a change in goal. Regular number one Dan Rose was due to have his wisdom teeth removed yesterday so George Legg will travel east from university in Portsmouth to take his place. Kick-off is 3pm.